This is a square Planters Fertilizers porcelain sign. This particular Planters Fertilizers sign is black with white print. 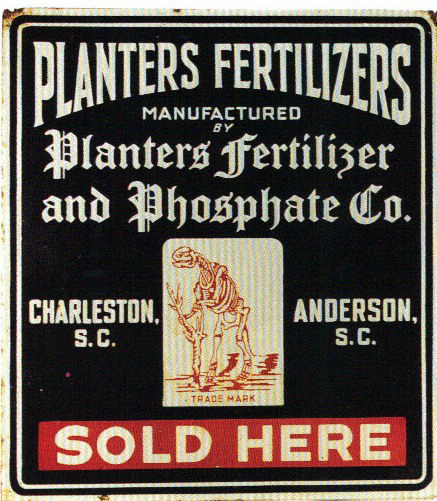 It reads, “Planters Fertilizers, Manufactured by Planters Fertilizer and Phosphate Co., Charleston, S.C., Anderson, S.C., Sold Here” and features a red dinosaur skeleton in the center above a red banner at the bottom of the sign.